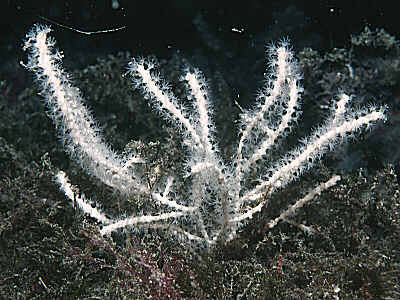 Description: A small sea-fan which forms slender colonies with little branching, up to 200mm tall but usually 70-100mm. Colour white or greyish, sometimes with a pinkish tinge. Habitat: Attached to bedrock and boulders in depths of 18-60m. Distribution: Recently re-discovered in several localities on the west coast of Scotland and in the Kenmare River, SW Ireland. Similar Species: The only other known British sea-fan is Eunicella verrucosa which is complexly branched, and usually salmon pink in colour. However white Eunicella do occur in most populations and in Galway Bay all individuals are rather sparsely branched and white in colour. Sea fan with infrequent branching. White or pale cream coloration. Picton, B.E. & Morrow, C.C. (2016). Swiftia pallida Madsen, 1970. [In] Encyclopedia of Marine Life of Britain and Ireland.